If you are a Chinese food lover, then this game is going to appeal greatly to you. The game invites players to accompany Wasabi San, one of the best Sushi chefs in the world. So players can get to enjoy a one of a kind experience that is filled with plenty of sushi samples and Chinese noodles. These foods appear on the reels of the game in the form of symbols. Other symbols include the sushi chef, a Chinese man, a female Chinese waiter and more. 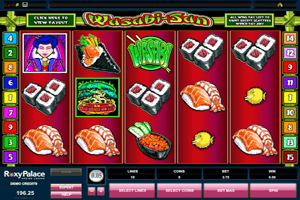 Play Wasabi San Slot here. The game has a high paying format of 5 reels and a total of fifteen lines that players are invited to place stake on. These stakes can be placed on the lines of the game as players go through the betting options that the game has which can be found at the control panel right under the reels of the game. The game has a Bonus round that is called the Fish Market round which is activated for players who get at least 3 yellow puff fish bonus symbols on any activated paylines. The Wasabi San Chef symbol can replace any other icons because it is a wild icon. Lastly, there is the Wasabi Chopstix symbol that can activate the free spins round through which players can claim 10 free spins during which all wins are tripled.